During the interview, a resume is a key to judge a candidate. You can get all the needed information about a person with the help of his or her resume. Whether it is personal, professional or educational. But a candidate’s resume can’t be always right. You need to be wary while checking someone’s resume. Because hiring a wrong employee can be very noxious for your company. 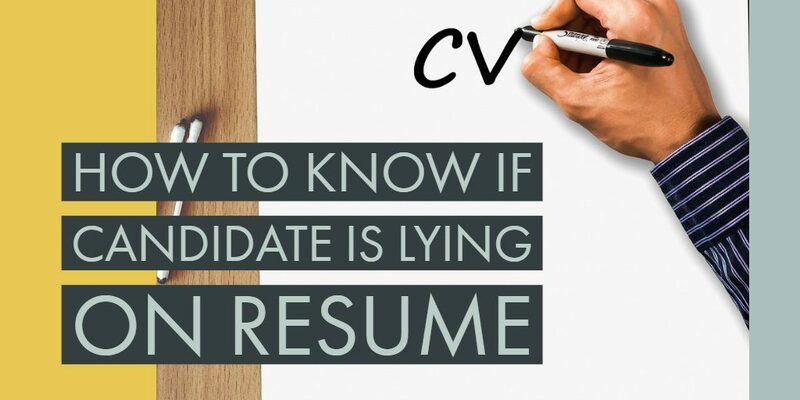 Here are some points which you should consider if you find something suspicious in a resume. If you find something dubious, start doing some extra research about the person. Nowadays, social media is an important thing for anyone. People want to share everything about there life there. Check out his/her Facebook, Instagram profile and try to dig deep, you will know more from there. Verify with the people who already know him/her. As soon as you feel something is wrong don’t ignore take a test during the interview. Ask the candidate some questions related to his/her job profile, you can use quiz method also to know better. Give the candidate some practical work which includes the skills listed in the resume. On the spot test can help you to find out more about candidates because they won’t be ready for it. Catching a liar is not easy but if you are experienced in your job, then it is not that hard either. If you notice that the job seeker is avoiding eye contact then it is the first sign of a lie. You don’t need confirmation about the person. If your instincts are saying, you are having the false resume in your hand. A person’s behavior tells a lot about himself. You can easily judge him the way he behaves. So, if you want to know then just focus on his behavior, his body language and the way he talks. Look directly into his eyes while you are taking the interview. Even the volume of voice tells enough about a person. If you notice unclear details of work experience and skills. Then it is possible that you are dealing with a false resume. Just check the dates of his qualification, achievement, and previous jobs. Confirm with references or a person who already knows him.